That's as simple and strong as I can advise you on, with finding help if you ever want to add the Nexus stuff. Having said that the Manfrotto stuff has always impressed me too. Good luck with your search. Edited by outofsight, 01 November 2018 - 11:44 PM. I like the fork mount but the only place I have found that has it in stock is Farpoint Astro for about 743ish. Where did you find yours? 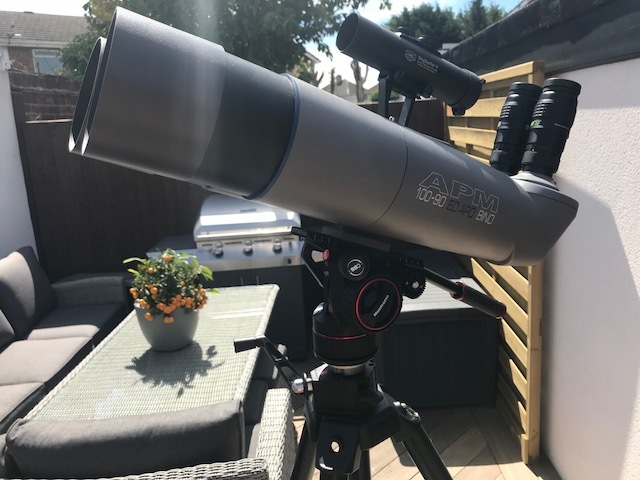 I purchased the fork mount when I purchased my 100 45 binos from Markus at APM. He has them on sale now on the APM sight, but you will still pay over 740ish because of shipping. Another option is to seek one on the CN swap and shop. the Oberwerk 5000 tripod head holds 16lbs (binos weigh a little over 14lbs), and is also a perfect setup with the Oberwerk wooden tripod. 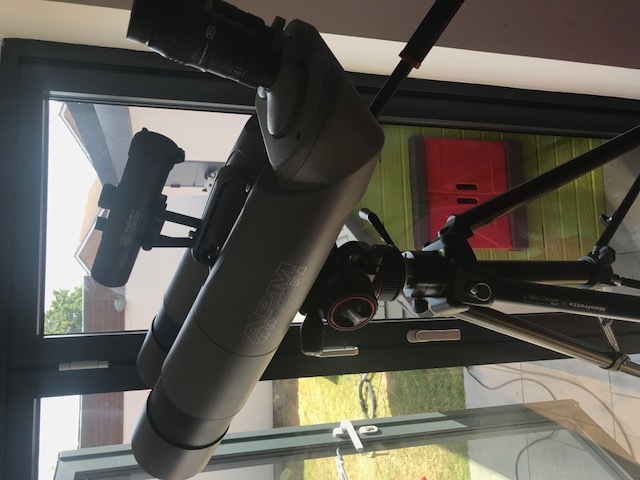 My cost effective set up for low power Wide Field viewing. Note that if you are considering putting encoders on an APM fork, you cannot retrofit the base model fork with encoders. I asked APM if this could be done and the answer was an emphatic "no". You have to buy it with encoders installed. Mike, which tripod and head are you using? Edited by junomike, 02 November 2018 - 07:45 AM. Bogen Imaging (formerly known as Bogen Photo Corporation) was the American company that used to distribute Manfrotto products in the USA. Bogen established a contract with Manfrotto for photographic and videographic supports equipment supply, in wich Manfrotto products had the Bogen designations printed in them for the US market. The products were manufactured by Manfrotto in Italy and all those products Bogen used to sell are Manfrottos original design and build. You will find every Bogen model number designation relates directly to Manfrotto designations, wich already existed in the Manfrotto catalogues prior to and along the commercial association between the two companies. Manfrotto was bought by the The Vitec Group in 1989, wich also bought the french Gitzo manufacturer in 1992, Bogen Imaging in 1993 and Satchler in 1995, amongst others. Bogen Imaging was renamed Manfrotto Distribution in 2010. The Vitec Group is hold by the Suffolk based Vinten company in the UK and keeps the companies operating independently. I have an APM 100 and use the Manfrotto 516 and 475B geared tripod. The 501 and 502, which I also own, are not suitable. You need the friction too much to keep it in place. On the 516 it is perfectly balanced and you can move it around without much effort. Great info, thanks for the input. I think I'm heading in this direction with the 516 and either the 3068 or 058b. Looking at used tripods, you need to take into account the vintage on the geared column tripods; pre-1993/4 have round columns with a fast ratio spur gear crank and wrap spring clutch to prevent the column from dropping inadvertently. Later models switched to a "hex" column with a slower ratio worm gear that didn't require the clutch. I've got 3036 models in both configurations; both have their pluses and minuses. Many replacement parts are still available but there have been a number of small changes over the years that may make finding the exact parts difficult. Bigger is better. I would recommend the Manfrotto 161mk2 tripod with an APM fork. The 475B is as stable as you would ever need for bino’s IMO. I tried the N12 on 475B and 161mk2B - no discernible difference. Any and all movement came from the N12 regardless of tripod. Same scenario when I used the sky tee 2. Extremely stable and any tiny movement come from the very slight slop in the mount. It was tiny, but it was in the mount, not the tripod. The tripod was nothing special. There is the trade off between size, stability and useability that really come into play with the heads/mounts. Fork mounts, geared heads (very stable by the way, and small), and video heads. I can slide the APM’s off the 475B and into my padded rucksack (vanguard alta sky 66) fold the tripod down and strap it to the back - approx 15-20kg all in. Very portable and light, and does a great job. The fork mount may perform better at 80x plus, but at 44x it’s perfect for me, and more appealing to carry around. Edited by RickyD85, 02 November 2018 - 05:30 PM. Dougeo - that’s the N12 head/475B combo. Also available in the N8 which may also work well, i’ve not tried one though. Edited by RickyD85, 02 November 2018 - 05:42 PM. I've got to admit I like the compact form factor of the N12 head under the binos. The APM fork works very well but is heavy and bulky, FWIW. How's the stability of the mount when it's raised to around 68-70"? 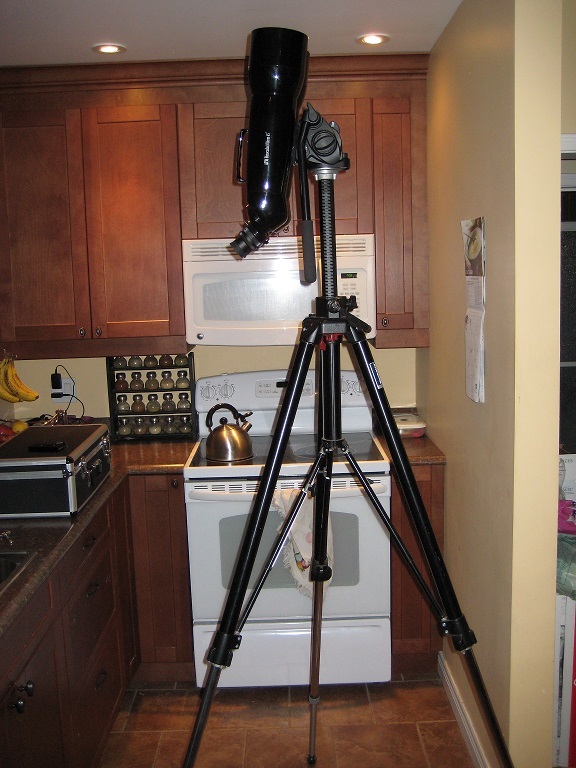 I'm looking at the 475, 058B and the 3068, they are all excellent tripods but does one shine above another? What finder scope are you using? To be honest I would prefer a green laser as my finder. Seems the same to me - the tripod has a lock for the extending part. As long as you keep it reasonably tight raising or lowering doesn’t make a noticeable difference. As I said any minor shake/movement when my eyes touch the eyepieces is from the N12 head.